Book AirAsia Indonesia flights & plane tickets on NusaTrip.com. Search any flight routes, compare prices with other airlines : Simple & Fast, 24/7 instant booking. Low cost airline (no baggage, no food or entertainment). Find all Air Asia flights on all routes, get the cheapest fares in Indonesia, Malaysia, Singapore, Thailand and in Asia when booking your Air Asia plane tickets, cheap, on NusaTrip.com. AirAsia Indonesia is a low cost airline based in Jakarta, Indonesia. It operates scheduled domestic within Indonesia region, international services and is an Indonesian associate carrier of Malaysian low-fare airline Air Asia. Its main base is Soekarno-Hatta International Airport, Jakarta. 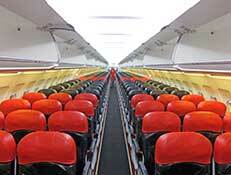 Indonesia AirAsia serves more than 20 destinations around Indonesia, Asia, and Australia. Cabin : Each guest is allowed one piece of cabin baggage AND 1 laptop bag OR 1 handbag on-board. The main cabin baggage shall not exceed 56cm x 36cm x 23cm and does not weigh more than 7kg. This baggage should also be able to fit under the seat in front of you or the overhead compartment. Fare do not include any checked in baggage (except for flights within Indonesia : fare includes 15kg). Extra checked in baggage can be purchased during NusaTrip flight checkout, look for add extra button in flight details. Each checked baggage must not exceed 81cm (H) x 119cm (W) x 119 cm (D) and 32kg in weight. Baby strollers and other mobility devices can be checked in for free. Guests checking in baggage which exceeds the pre-booked allowance will be charged on a per kg basis based on AirAsia fee schedule. Domestic Flights: Opens 2 hours before departure and closes 45 minutes before departure. Soekarno-Hatta International Airport Jakarta Departure : Terminal 2E for international flights and 2F for domestic. Fares apply only to carriage from the airport at the point of origin to the airport at the point of destination. Fares exclude ground transport services between airports and between airports and town terminals unless otherwise specifically stated by AirAsia. Airport tax payment has to be made at the airport for flights departing from Indonesia and Philippines. Sports Equipment Fee is applicable to Surfboards, Snowboards, Bicycles, Scuba, Golf, Cricket and Snow Skiing gears. Any other sporting equipments (that was not stated earlier) are accepted as part of the baggage allowance. Time and date changes are available. Name change option only available for Premium Flatbed class. Passenger may change flights up to forty-eight (48) hours prior to the scheduled flight departure time. Route change is not allowed. Changes are not applicable at promo fares.